After a few early faltering steps this planting season with what was always going to be an ambitious target (getting one billion trees into the ground over a 10-year period), the New Zealand Government has finally provided the stimulus to get the country’s planting programme back on track. Friday last week saw the launch of the One Billion Trees Fund. It sees NZ$118 million being allocated for grants to landowners and organisations to plant trees and another NZ$120 million set aside for partnership projects aimed at reducing barriers to tree planting. For the forestry industry, the grants are welcomed. Probably less appealing though is the fact that with the direct grants, significantly better rates are being offered to land owners that plan on planting indigenous species ($4000 for an indigenous mix c.f. $1500 for exotic plantings). So, why the preferential treatment? Establishment costs? It also appears that the Government’s aiming for two-thirds of future plantings under the new fund to be native plantings. 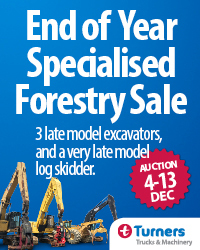 Full details on the new scheme along with the eligibility criteria can be found on the Forestry New Zealand website. As part of the recently completed ForestTECH 2018 series, local resource managers and inventory foresters were treated to updates on results from recent trials using UAVs in collecting forestry data using a variety of sensors. In addition, new platforms including the large 100kg unmanned helicopter and new vertical take-off and landing UAV, both well suited to local forestry operations were unveiled. Information on all presentations were sent out to all delegates last week. This week we cover a story on a Seattle-based start-up company, DroneSeed. They’ve kitted themselves out to provide a new service to forestry companies. Earlier this year, the company was awarded the first multi-craft, over-55-pounds unmanned aerial vehicle license ever issued by the FAA. Its custom UAV platforms are equipped with multispectral camera arrays, high-end lidar, 23 litre tanks of herbicide and proprietary seed dispersal mechanisms. With one of the aims of the One Billion Trees Fund to encourage planting of native trees, trees for erosion control, and environment-focused planting, maybe this might be an option moving forward. They now have 3 of the 5 largest timber companies in the U.S. on board. You can check out their story and a video that covers the new operation below. The other resource worth checking out is a detailed report that’s just been produced by FrontierSI, formally the CRC for Spatial Information. It’s titled UAV Data Acquisition, Australia and New Zealand. The comprehensive research involved consulting with 135 people who either use, broker or supply UAV data, from 80 organisations across government, private sector, industry and research. 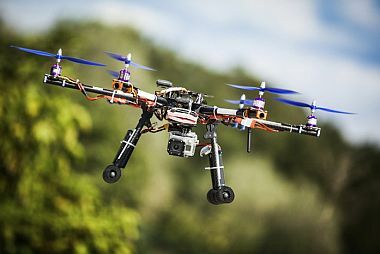 Nearly 62 per cent of the participants were either suppliers of UAV data or capture their own UAV data for internal use. The link to the full report is contained in the UAV data acquisition story. Finally, and with the Christmas break coming up fast, Friday Offcuts will also be taking a holiday over the summer period. For advertisers, the last issue for 2018 will be next Friday, 14 December. 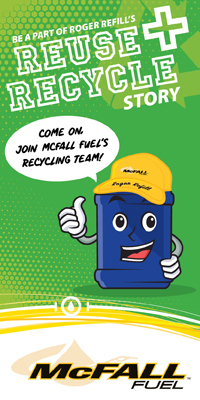 So, if taking out an advert, remember to get it to us no later than 4pm next Thursday. The first issue planned for 2019 will be on Friday 18 January. That’s it for this week. New Zealand Forestry Minister Shane Jones and Agriculture Minister Damien O’Connor on Friday launched the One Billion Trees Fund – a crucial step toward achieving the goal of planting at least one billion trees by 2028. Led by Te Uru Rākau – Forestry New Zealand, the Fund provides NZ$118 million for simple and accessible grants to landowners and organisations looking to plant trees. It also provides NZ$120 million for partnership projects that aim to reduce the barriers to tree planting through innovation, research and sector development initiatives. “The One Billion Trees Programme sets an ambitious target, but brings with it the huge opportunity to revitalise our regions and create real economic, social and environmental benefits across the country. It will also support Māori to realise the potential of their land,” Shane Jones said. It brings the total for the One Billion Trees Programme, funded from the Provincial Growth Fund, to NZ$480 million, with other initiatives including joint ventures between landowners and Crown Forestry to plant commercial forestry, and the community planting programme Matariki Tu Rākau. Applications to the new Fund are now open through Te Uru Rākau and can be submitted all year round. Further coverage can be found here. Full details on the new scheme along with eligibility criteria can be found on the Te Uru Rākau or Forestry New Zealand website. Minister for Agriculture David Littleproud, Assistant Minister for Agriculture Senator Richard Colbeck and NSW Minister for Lands and Forestry Paul Toole said the improvements and the 20-year extension to the RFAs provide long-term confidence and sustainability for the future of NSW’s AU$2.4 billion wood product manufacturing industry. “We’re pleased to deliver our commitment on these RFAs,” Minister Littleproud said. “We understand certainty matters to business and that’s what we delivered.” Assistant Minister Colbeck said the forest industry was the backbone of many regional communities and was set to provide even more opportunities under the extended RFAs. New South Wales Minister for Lands and Forestry Paul Toole said as a result of the NSW RFAs, the native forest timber industry operates with some of the highest levels of sustainability in the world. “The renewed Agreements pave the way for the continued sustainable management of the state’s forests, while providing critical protection of the environment and threatened species,” Minister Toole said. The Agreements will be underpinned by the NSW Government’s AU$7.2 million forest monitoring program that focuses on adaptive management and fine-tuning in NSW’s management of the forest estate. Wildfires are consuming North American forests and grasslands faster than we can replace them. It’s a vicious cycle of destruction and inadequate restoration rooted, so to speak, in decades of neglect of the institutions and technologies needed to keep these environments healthy. DroneSeed is a Seattle-based start-up that aims to combat this growing problem with a modern toolkit that scales: drones, artificial intelligence and biological engineering. And it’s even more complicated than it sounds. The most effective and common reforestation technique for a recently burned woodland is human planters carrying sacks of seedlings and manually selecting and placing them across miles of landscapes. This back-breaking work is rarely done by anyone for more than a year or two, so labour is scarce and turnover is intense. Even if the labour was available on tap, the trees might not be. Seedlings take time to grow in nurseries and a major wildfire might necessitate the purchase and planting of millions of new trees. It’s impossible for nurseries to anticipate this demand, and the risk associated with growing such numbers on speculation is more than many can afford. One missed guess could put the whole operation underwater. One final complication: helicopter spraying is a horrendously dangerous profession. These pilots are flying at sub-100-foot elevations, performing high-speed manoeuvres so that their sprays reach the very edge of burn zones but they don’t crash head-on into the trees. This is an extremely dangerous occupation: 80 to 100 crashes occur every year in the U.S. alone. So, what’s the solution to all this? Automation, right? High tech forest harvesting company FORCO have announced their dealership agreement with ecoforst, an innovative Austrian company that produces the T-WINCH. 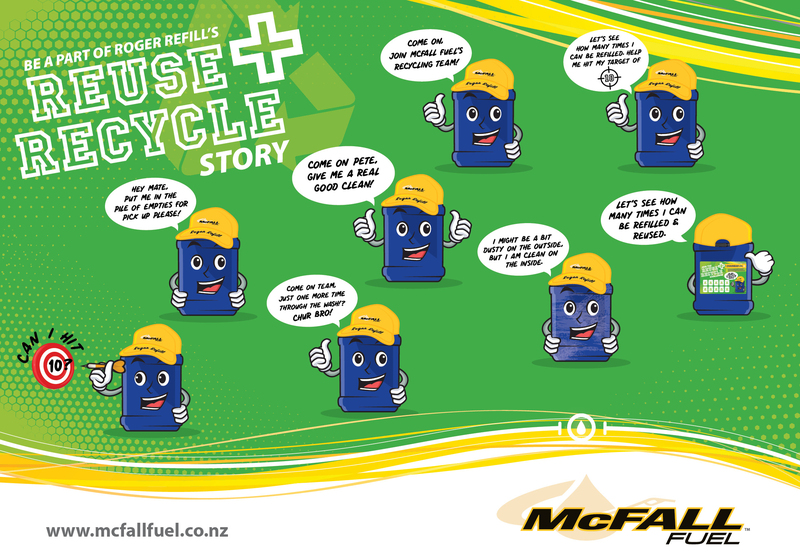 FORCO are now the dealer for ecoforst products in both New Zealand and Australia. 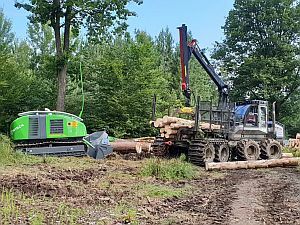 They’ll also be involved, along with most major equipment and technology suppliers to wood harvesting operations in this part of the world in the wood harvesting event, HarvestTECH 2019, being run in Rotorua next year on 26-27 June 2019. More than 80 original T-WINCH 10.1 machines have been sold all over the world through dealers based across Europe, North America, South America and now New Zealand and Australia. The T-WINCH 10.1 is used with tracked feller buncher machines, skidders, harvesters and forwarders. FORCO will be supporting a customer that has purchased the first ecoforst T-WINCH 10.2 in New Zealand. The machine is scheduled to arrive late this year and be operating by February 2019. The T-WINCH 10.2 is the second T-WINCH model produced by ecoforst and is an upgraded version of the 10.1 with more power. Demand for a machine with even greater power and a faster line speed was strong, so ecoforst developed the powerful T-WINCH 15.1. This machine has been designed with customers from Chile in mind. 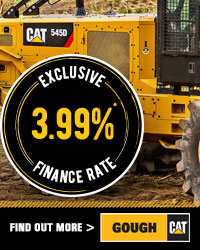 It is ideal for use with skidders because of the fast line speed, up to 8 kilometres per hour. The T-WINCH has an innovative computer system, which allows for fully automated operation. The operator sets the tension required via remote control in the cab of the attached machine, and the T-WINCH does the rest. The computer has one simple command “maintain the tension”, which enables the operator to effectively “set and forget” as the computer will pull rope in if the machine is traveling uphill or let rope out if the machine is traveling downhill. Tension on the cable is constantly maintained as the computer controls an advanced closed hydraulic system, preventing the cable from sagging or bouncing. The smooth and reactive operation avoids shock loading on the cable and ensures maximum traction on slopes. So, mark the dates into your diary for next year, 26-27 June 2019. It’s shaping up to be another major gathering of wood harvesting contractors and harvest planners. Stop Press: The two-day programme for the June 2019 event has just been posted onto the website. You can check out what's been planned, what's been covered and who will be presenting at this regions major two-yearly wood harvesting event, HarvestTECH 2019 from the event website, www.harvesttech.events. 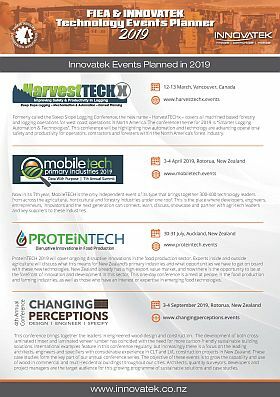 Again, after an incredibly busy year, the Forest Industry Engineering Association (FIEA) has in conjunction with a wide cross section of industry, in both New Zealand and Australia, developed a Technology Events Planner for next year. With very high turnouts again at all FIEA technology events run this year, we’re really excited with what 2019 holds. The Events Planner (FIEA and Innovatek) will enable forestry and wood products companies to pencil the dates into your own calendar for next year. For industry associations, research organisations and those involved in setting up your own programmes for 2019, the calendar will enable you to take note of the dates (and ideally look to dovetail in to the tech events timing and location to add value to those attending). For product, equipment and technology providers and service suppliers, we hope this forward planning will also enable you to schedule your involvement and to budget early on in the year. For overseas suppliers, it will enable you to lock in a time to plan visits to your key customers or distributors in Australia and New Zealand and to link in to the relevant technology events in this part of the world next year. Please click here to access the calendar of 2019 technology events. -	You’d (or a company you are representing) like to put your name forward to present at a 2019 event. -	You’d like to be sent further information on exhibiting or sponsoring any one of the events being planned. -	You’d like to be considered to run a short workshop alongside one of the events being planned in 2019. This increasingly is being used at our technology events. It optimises the time at the conference for delegates and of course capitalises on the expertise being brought in for the event. The MobileTECH 2019 event is running on 3-4 April 2019 in Rotorua, New Zealand. The UK government has just released details of its ban on combustible building materials in the wake of the Grenfell Tower tragedy, revealing that it will limit the use of cross-laminated timber in construction. The legislation, titled Final Impact Assessment: Ban on combustible materials in external wall systems, has been published by the Ministry of Housing, Communities and Local Government. It confirms that no combustible materials will be permitted on the external walls of any new buildings taller than 18 metres. They will also be banned in renovations of existing buildings. As well as housing buildings, it will apply to student accommodation, registered care homes, hospitals and boarding school dormitories. The policy limits the use of materials to those with a European fire rating of Class A1 or A2, and states explicitly that wood products do not come under this classification. "The policy prohibits the use of timber materials in the external wall of buildings within the scope," it states. While foresters don’t necessarily have to abandon their diameter tapes and vertex hypsometers, there is no denying that rapidly-evolving remote sensing technologies are revolutionising forest management practices. Field-based inventory methods and sampling designs can estimate variables such as height, volume, basal area and number of trees fairly accurately, if enough sampling plots are included, but this approach is labour-intensive and costly. An emerging, diverse collection of platforms, sensors, algorithms and efficient processing workflows offer opportunities across the forestry sector to gather more reliable and effective information. It is vital that the data collected can be easily accessed and applied to practice. FWPA’s RD&E program has provided funding for a series of projects focused on the evaluation and application of remote sensing technology for the Australian forestry sector. The most recent of these, “ Optimizing remotely acquired, high resolution remotely sensed data for plantation inventory”, edited by Drs Michael Watt and Christine Stone, is available on the FWPA website. The aim of the project, led by industry partner Scion, was to optimise the extraction and processing of meaningful information from data which were acquired using LiDAR (Light Detection and Ranging) sensors mounted on light aircraft, such as helicopters, and UAVs. Several remote LiDAR systems were evaluated in relation to their specifications and procedures for optimal data acquisition. This important project brought together internationally recognised expertise - in remote sensing, Airborne Laser Scanning (ALS) and UAV technologies - to harness the rapid technological advances in data capture and processing as a tool for forest management. The team included researchers from the University of Tasmania’s TerraLuma group, the New Zealand forest research agency Scion, the University of Sydney’s Australian Centre for Field Robotics and the NSW Department of Primary Industries, as well as a collaborative engagement with industry through Interpine and Indufor Asia Pacific. The project focused on using point cloud data to capture the shape and structure of the canopy surface, allowing greater access to sub-canopy information such as stem characteristics. A point cloud is a set of data points in space. The data is collected by laser scanners beaming pulses of light waves to the external surfaces of objects (e.g. trees). The points where the beams make contact are used to create 3D images of the targeted objects. The researchers compared a variety of 3D visualisation software packages for viewing dense point cloud datasets and looked at the potential of applying immersive virtual reality technology for the on-screen assessment of individual tree stems. Hopefully there will be a broader operational adoption of dense point cloud data by plantation growers in Australia and New Zealand, for the assessment and monitoring of plantations at both the stand and tree-level scales. As technologies advance, they provide increased direct benefits — e.g. more accurate and reliable data capture — as well as indirect benefits, such as increased safety and reduced operational time and costs through remote access to difficult or dangerous locations for on-ground inventory crews. FrontierSI (formally the CRC for Spatial Information) have released their UAV Data Report. For those involved in using UAV’s, this recent 114-page report titled UAV Data Acquisition, Australia and New Zealand, is a useful reference – and read. Unpiloted aerial vehicles (UAVs) have come a long way from their military origins. In addition to being one of the latest must-have gadgets for tech enthusiasts, UAVs – or drones – are now indispensable tools across a wide range of sectors. The mining industry uses UAVs for calculating stockpile volumes; foresters use them to count trees; local governments use them to count roof-top solar panels and assess the state of footpaths; environmental managers use them to count wildlife or look for landslide risk areas; and emergency services use drones during bushfires and for search and rescue operations. UAVs are also used in agriculture, forestry, surveying, construction, and even to document heritage buildings. Whether they’re fixed-wing, multi-rotor or hybrid versions, unpiloted aerial vehicles are not only relatively cheap to use, they can also be deployed more quickly and easily than other remote sensing methods such as piloted surveillance aircraft. Despite the advantages of UAV capture, an ongoing issue with the low quality of the data provided by some UAV data suppliers is causing considerable frustration, cost and set-backs for users. 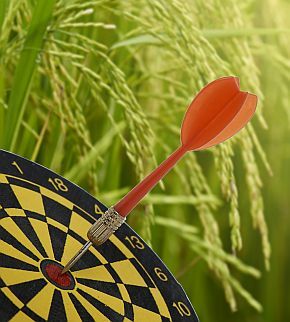 This situation often arises because UAV data suppliers don’t necessarily understand what the end-users need from the data. This report aims to capture, explore and address that gap in understanding. FrontierSI, in collaboration with the Mineral Research Institute of Western Australia (MRIWA) and Department of Environment, Land, Water and Planning (DELWP) Victoria, has investigated how UAVs are being used to capture and acquire data, and how that data is being used. The research involved consultations with 135 people who either use, broker or supply UAV data, from 80 organisations across government, private sector, industry and research. Nearly 62 per cent of these participants were either suppliers of UAV data or capture their own UAV data for internal use. Broker organisations were those offering value-added services such as spatial analysis and feature extraction. The FrontierSI UAV report can be accessed here. The Tasman District Council will not take legal action against forestry companies in the wake of damage from ex-Tropical Cyclone Gita. "In our case, there were no offences that would warrant any enforcement action against any forestry company," said council environment and planning manager Dennis Bush-King. His comments come after news that Gisborne District Council has started prosecutions against "a number of parties" under the Resource Management Act. The prosecutions relate to six different forests in the Gisborne region on the East Coast of the North Island, including three near Tolaga Bay. 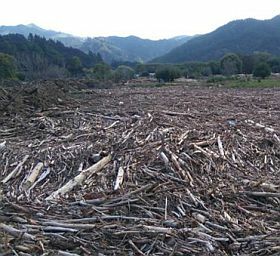 Debris, including forestry slash, covered pockets of Tasman district after Gita hit in February. In the Gisborne region, slash – scrap timber, branches and off cuts – crashed through some houses near Tolaga Bay over Queen's Birthday weekend in June. The prosecutions are due to begin in the new year and Gisborne council chief executive Nedine Thatcher Swann said there would be no comment while the matters were before the courts. Bush-King said the Tasman council was "not privy to the circumstances or what has led to the decision behind Gisborne District Council taking action". The Tasman council was dealing with wide-ranging effects from storm damage after Gita "and responded accordingly, including surveys of forest estates". "There were no formal compliance investigations initiated as there was no evidence of any offending on the part of the forest companies that would warrant them," Bush-King said. "Slope failures occurred in all areas of exotic and indigenous and there was little evidence of platforms, tracks and crossings failing in forestry blocks as a result of inaction or poor practices." He added that even if a case could be made, the Tasman council could not follow the same path as the Gisborne council because there was a six-month limitation period "and we would be outside that timeframe". The Gisborne council might have a different consenting regime, Bush-King said. 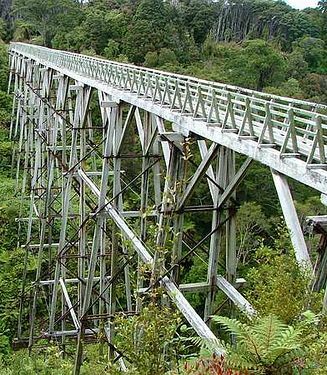 An historic wooden trestle viaduct that once serviced the sawmilling industry has been restored and is once again open to visitors to the magnificent Waitutu forest in the South of New Zealand. Conservation Minister Eugenie Sage celebrated the reopening of southern Fiordland’s Percy Burn viaduct, thought to be the highest surviving wooden bridge in the world, following significant restoration work. “In its day, the Port Craig sawmill was part of one of New Zealand’s major logging ventures. The closure of the mill in 1928 helped preserve the distinctive coastal beech/podocarp forests of Waitutu. The Percy Burn viaduct is located on the South Coast and Hump Ridge Tracks. The Hump Ridge Track includes a three-day walk taking in the coastline, forest and alpine regions of southern Fiordland. The Hodgman Majority Liberal Government has provided AU$1 million to the Tasmanian Timber Promotion Board for a national campaign to promote Tasmanian timber. Tasmania has some of the highest quality timber produced anywhere in the world, and the campaign will promote the quality and sustainability of Tasmanian timber industry. The Government’s AU$1 million contribution matches industry contributions from a wide cross-section of forestry companies, including Neville Smith Forest Products, McKay Timber, Britton Timbers, Porta, Hydrowood, Specialty Veneers, Corinna Timbers and Oak Industries. 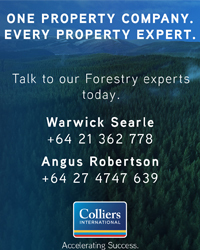 The Tasmanian Timber campaign will run across the country until mid-2021 to raise awareness of Tasmanian timber and its applications, with the goal of increasing the average selling price of Tasmanian timber in the national marketplace. The campaign will be distributed via various platforms, including video, social and digital media, trade shows, photography and other means. I may just look like an ordinary guy", he said to her, "but in just a few years, my father will die and I will inherit $200 million". Women are just so much better at financial planning than men. And one more for you. A man was telling his neighbour, "I just bought a new hearing aid. It cost me four thousand dollars, but it's state of the art." "Really," answered the neighbour. "What kind is it?" And on that note, enjoy your weekend and your Xmas shopping. Cheers.